Even in small Paleolithic communities that lived 34,000 years ago, our early ancestors seem to have been aware of the dangers of inbreeding. Anthropologists report finding evidence of complex social structures at a site in Sunghir, Russia, which suggests people took precautions against inbreeding. One of the burials from Sunghir, in Russia. Credit: University of Cambridge, UK. 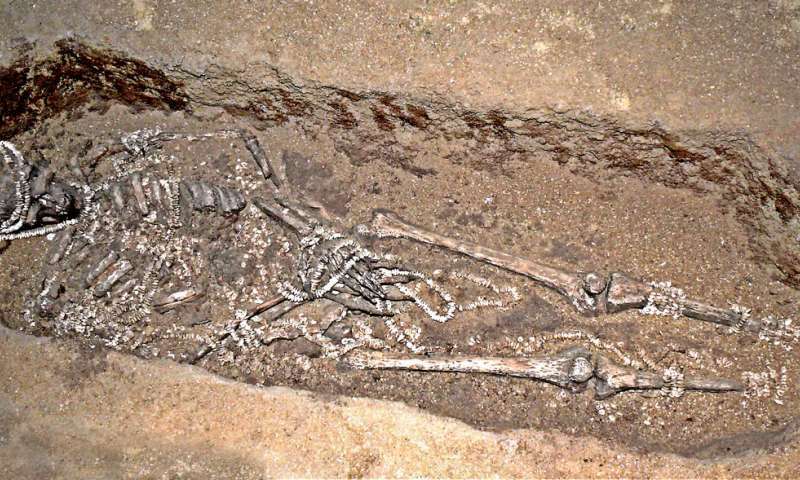 The Upper Paleolithic burial site contains the complete remains of an adult male, the symbolically incomplete remains of another male, as well as those of two younger individuals. All of these people lived at this site during the same time. Unusual for similar finds from this period, all the four males were buried together. When a team of scientists at the Cambridge University and the University of Copenhagen analyzed the genomes of these individuals, they were surprised to find they were not closely related. At most, one of the adults was no more related to the boys than a great-great-grandfather. The researchers speculate that artifacts found at this location, which includes pieces of jewelry, may have been used in ceremonies and rituals that celebrated the exchange of mates between groups. Perhaps such exchanges foreshadowed modern marriage ceremonies. In addition to the evidence that modern humans formed close-knit communities more than 30,000 years ago, this evidence also indicates that they deliberately sought mates beyond their immediate family. To avoid inbreeding, communities were likely connected to a wider network. “What this means is that even people in the Upper Paleolithic, who were living in tiny groups, understood the importance of avoiding inbreeding,” Professor Eske Willerslev, fellow at St. John’s College, Cambridge said in a statement. Previously, a study published in Nature found evidence of heavy inbreeding among Neanderthals, judging from a 50,000-year-old toe bone. Other studies also seem to indicate that Eurasian hominids were much more inbred and less genetically diverse than modern humans. For thousands of years, the Neanderthal population size remained small, and mating among close relatives was likely very common. The Neanderthal genome included harmful mutations that made hominids around 40% less reproductively fit than modern humans. They had the last joke, though — non-African humans carry the burden of their inbreeding to this day. Some 2% of our DNA is Neanderthal, and due to our distant cousins’ interbreeding events, harmful gene variants continue to reduce the reproductive fitness of some populations today. The genomic analysis of the Sunghir remains partly explain why anatomically modern humans were more successful than Neanderthals, who went extinct some 40,000 years ago. Scientific reference: M. Sikora el al., “Ancient genomes show social and reproductive behavior of early Upper Paleolithic foragers,” Science (2017).